Riding a motorcycle can be dangerous. 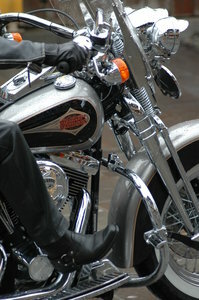 Riders face more risks for being killed in a motorcycle accident in Boston than do the occupants of passenger-vehicles. The Insurance Institute for Highway Safety (IIHS) says there is one thing that a motorcyclist can do to help reduce these risks — antilock brakes. To help spread the word, the IIHS has released a new pamphlet, “Motorcycle ABS: Why you want to ride with it,” explaining exactly why you’re safer with this braking system. This brochure explains exactly what antilock brakes do, how they work and what their benefits are for riders. It has been created to be handed out at motorcycle showcasing events, rider training programs and other motorcycling venues. The bottom line is that the IIHS is encouraging riders to embrace the new technology and to choose bike models with the safe braking system. Our Massachusetts motorcycle accident attorneys understand that motorcycles have two separate braking systems, one for the front tire and one for the back. Braking on a motorcycle is much more difficult that braking in a passenger vehicle. When braking on a motorcycle, either wheel can lock up and a driver could potentially lose control or balance and suffer a deadly fall. When making a sudden brake in a car, the vehicle may skid. No harm done. With the antilock brakes, motorcyclists can brake without the fear of locking up. “Research shows that motorcycle antilocks dramatically cut the risk of a deadly crash,” says Institute president Adrian Lund. The antilock braking system knows when to reduce the pressure applied on your brakes right before you’re about to experience a lockup. The system knows when to reapply pressure once you’ve regained traction, too. Riders don’t typically notice any changes in non-emergency braking with the new system since the technology is only used when the motorcycle’s wheels are about to stop spinning. The braking system comes standard on some bikes and can come as an add-on feature to many bikes. Riders are encouraged to opt for the safe-braking system. Bikes that have the antlock braking system have been proven to have a near 40 percent lower rate of deadly accidents than the same models without the system, according to the IISH. Highway Loss Data Institute statistics report that there more than a 20 percent reduction in the number of collision insurance claims that are filed for motorcycles with antilocks than for bikes without it. The braking system has been proven to be safe for motorcyclists of all capabilities. Even the most trained motorcyclists are, at times, forced to brake hard. Road surfaces can play a large role in the outcome of a harsh braking scenario. Unexpectedly sandy or slippery roads can cause a rider to crash. The Austrian Road Safety Board recently conducted a study that concluded that beginner, moderate and expert riders can stop quicker and more safely with the new braking system. In 2009, more than 4,000 people were killed in motorcycle accidents. If antilock braking systems had been presence on all bikes, experts believe this number could have been much, much lower. The Massachusetts motorcycle accident lawyers at the Law Offices of Jeffrey S. Glassman, LLC, have nearly 20 years of experience handling serious and fatal traffic accident cases and representing those injured or killed in a Boston motorcycle accident. If you have been injured or someone you love has been injured or killed in a Boston-area accident, call 1-877-617-5333 to schedule a free initial consultation to discuss your rights.